Anne Louise Germaine Necker. 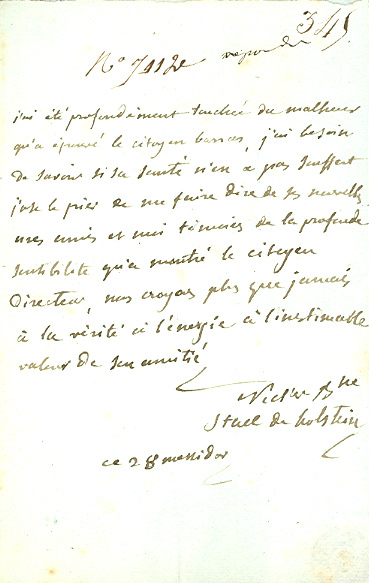 French writer; exiled by Napoleon I.
Autograph Letter Signed, Necker Stael de Holstein, one full page, octavo, 28 messidor, no year. To Citizen [Paul] Barras, a member of the Directory. Barras was an early supporter of Napoleon, and in fact secured the young generals appointment to command the Army in Italy. It was Barras who introduced Napoleon to Josephine, Barrass former mistress. 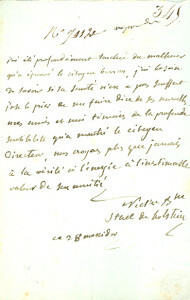 Madame de Stael rarely signed her letters and it is unusual to find one signed in full.